For other uses, see AY (disambiguation). Pharaoh Ay performing the Opening of the Mouth ceremony on Tutankamun. Ay is wearing the Leopard skin worn by Egyptian High Priests and a Khepresh, a blue crown worn by Pharaohs. Ay was the penultimate Pharaoh of Ancient Egypt's 18th dynasty. He held the throne of Egypt for a brief four-year period (probably 1323–1319 BC or 1327–1323 BC, depending on which chronology is followed), although he was a close advisor to two and perhaps three of the pharaohs who ruled before him and is thought to have been the power behind the throne during Tutankhamun's reign. Ay's prenomen or royal name—Kheperkheperure—means "Everlasting are the Manifestations of Ra" while his birth name Ay it-netjer reads as "Ay, Father of the God". Records and monuments that can be clearly attributed to Ay are rare, not only due to his short length of reign, but also because his successor, Horemheb, instigated a campaign of damnatio memoriae against him and other pharaohs associated with the unpopular Amarna Period. Ay is usually believed to be a native Egyptian from Akhmim. During his short reign, he built a rock cut chapel in Akhmim and dedicated it to the local deity there: Min. He may have been the son of Yuya, who served as a member of the priesthood of Min at Akhmim as well as superintendent of herds in this city, and his wife Tjuyu. If so, Ay could have been of partial non-Egyptian, perhaps Syrian, blood since the name Yuya was uncommon in Egypt and is suggestive of a foreign background. Yuya was an influential nobleman at the royal court of Amenhotep III who was given the rare privilege of having a tomb built for his use in the royal Valley of the Kings presumably because he was the father of Tiye, Amenhotep's chief Queen. There are also noted similarities in the physical likenesses of monuments attributed to Ay and those of the mummy of Yuya, and both held similar names and titles. A stone block shows Ay receiving the "Gold of Honor" award in his Amarna tomb from Akhenaten. All that is known for certain was that by the time he was permitted to build a tomb for himself (Southern Tomb 25) at Amarna during the reign of Akhenaten, he had achieved the title of "Overseer of All the Horses of His Majesty", the highest rank in the elite charioteering division of the army, which was just below the rank of General. Prior to this promotion he appears to have been first a Troop Commander and then a "regular" Overseer of Horses, titles which were found on a box thought to have been part of the original furnishings for his tomb. Other titles listed in this tomb include Fan-bearer on the Right Side of the King, Acting Scribe of the King, beloved by him, and God's Father. The 'Fan-bearer on the Right Side of the King' was a very important position, and is viewed as showing that the bearer had the 'ear' of the ruler. The final God's Father title is the one most associated with Ay, and was later incorporated into his royal name when he became pharaoh. This title could mean that he was the father-in-law of the pharaoh, suggesting that he was the son of Yuya and Tjuyu, thus being a brother or half-brother of Tiye, brother-in-law to Amenhotep III and the maternal uncle of Akhenaten. If Ay was the son of Yuya, who was a senior military officer during the reign of Amenhotep III, then he likely followed in his father's footsteps, finally inheriting his father's military functions upon his death. Alternatively, it could also mean that he may have had a daughter that married the pharaoh Akhenaten, possibly being the father of Akhenaten's chief wife Nefertiti. Ultimately there is no evidence to definitively prove either hypothesis. The two theories are not mutually exclusive, but either relationship would explain the exalted status to which Ay rose during Akhenaten's Amarna interlude, when the royal family turned their backs on Egypt's traditional gods and experimented, for a dozen years or so, with an early form of monotheism; an experiment that, whether out of conviction or convenience, Ay appears to have followed under the reign of Akhenaten. The Great Hymn to the Aten is also found in his Amarna tomb which was built during his service under Akhenaten. His wife Tey was born a commoner but was given the title Nurse of the Pharaoh's Great Wife. If she were the mother of Nefertiti she would be expected to have the royal title Mother of the Pharaoh's Great Wife instead; had Ay been the father of Nefertiti, then Tey would have been her stepmother. In several Amarna tomb chapels there is a woman whose name begins with "Mut" who had the title Sister of the Pharaoh's Great Wife. This could also be a daughter of Ay's by his wife Tey, and it is known that his successor Horemheb married a woman with the name Mutnodjimet. Ay performing the opening of the mouth ceremony for Tutankhamun, scene from Tutankhamun's tomb. Ay's reign was preceded by that of Tutankhamun, who ascended to the throne at the age of eight or nine, at a time of great tension between the new monotheism and the old polytheism. He was assisted in his kingly duties by his predecessor's two closest advisors: Grand Vizier Ay and General of the Armies Horemheb. Tutankhamun's nine-year reign, largely under Ay's direction, saw the gradual return of the old gods – and, with that, the restoration of the power of the Amun priesthood, who had lost their influence over Egypt under Akhenaten. Egyptologist Bob Brier suggested that Ay murdered Tutankhamun in order to usurp the throne, a claim which was based on X-ray examinations of the body done in 1968. He also alleged that Ankhesenamun and the Hittite prince she was about to marry were also murdered at his orders. This murder theory was not accepted by all scholars, and more detailed CT scans of the mummy undertaken by National Geographic (published in late 2005) suggested that Tutankhamun did not die from a blow to his head as Brier had theorized. The National Geographic forensic researchers instead presented a new theory that Tutankhamun died from an infection caused by a badly broken leg since he is often portrayed as walking with a cane due to spina bifida, a hereditary trait in his family on his father's side. The bone fragments found in Tutankhamun's skull were most likely the result of post-mortem damage caused by Howard Carter's initial examination of the boy king "because they show no evidence of being inundated with the embalming fluid used to preserve the pharaoh for the afterlife". However, Brier has stated that the bone fragment in the skull is not relevant to the issue of whether Tutankhamun was murdered, acknowledging that it was likely caused by the embalmers. The evidence Brier presents for the murder is a dark spot on the base of the skull, indicating a blow to the head. Dr. Gerald Irwin agrees with Brier on this point. When the results of the CT scan examination had been published, many scientists accepted its findings, but some still believe the mystery of Tutankhamun's death is far from solved and continue to support the older murder theory. There are books that have subsequently been published that adhere to the original murder theory and dispute the conclusions reached by the CT scan team, though also citing other means of murder, such as poisoning. In 2010, a team led by Zahi Hawass reported that he had died from complications caused by malaria and Köhler disease but another team from the Bernhard Nocht Institute for Tropical Medicine in Hamburg believes his death was caused by sickle cell disease. Tutankhamun could very well have died from this, combined with the infection in his knee. Ay was also buried in the tomb intended for Tutankhamun in the West Valley of the Kings (WV23), and Tutankhamun in Ay's intended tomb in the East Valley of the Kings (KV62). Faience plate with the complete royal titulary of Ay, Egyptian Museum. Fragment of a cartouche of Ay in the Petrie Museum. Tutankhamun's death around the age of 18 or 19, together with his failure to produce an heir, left a power vacuum that his Grand Vizier Ay was quick to fill: Ay is depicted conducting the funerary rites for the deceased monarch and assuming the role of heir. The grounds on which Ay based his successful claim to power are not entirely clear. The Commander of the Army, Horemheb, had actually been designated as the "idnw" or "Deputy of the Lord of the Two Lands" under Tutankhamun and was presumed to be the boy king's heir apparent and successor. It appears that Horemheb was outmaneuvered to the throne by Ay, who legitimized his claim to the throne by burying Tutankhamun, as well as possibly marrying Ankhesenamun, Tutankhamun's widow. Since he was already advanced in age upon his accession, Ay ruled Egypt in his own right for only four years. During this period, he consolidated the return to the old religious ways that he had initiated as senior advisor and constructed a mortuary temple at Medinet Habu for his own use. A stela of Nakhtmin (Berlin 2074), a military officer under Tutankhamun and Ay—who was Ay's chosen successor—is dated to Year 4, IV Akhet day 1 of Ay's reign. Manetho's Epitome assigns a reign length of four years and one month to Horemheb, and this was usually assigned to Ay based on this Year 4 dated stela; however, it is now believed that figure should be raised by a decade to fourteen years and one month and attributed to Horemheb instead, as Manetho intended. Hence, Ay's precise reign length is unknown and he could have ruled for as long as seven to nine years, since most of his monuments and his funerary temple at Medinet Habu were either destroyed or usurped by his successor, Horemheb. ... is broken after the signs for "King's Son of", and there has been considerable debate as to whether it continued to say "Kush", making Nakhtmin a Viceroy of Nubia, or "of his body", making him an actual royal son. Since there is no other evidence for Nakhtmin as a Viceroy—with another man [Paser I] attested in office at this period as well—the latter suggestion seems the most likely. As Nakhtmin donated items to the burial of Tutankhamun without such a title, it follows that he only became a King's Son subsequently, presumably under Ay. This theory is supported by the evidence of intentional damage to Nakhtmin's statue, since Ay was amongst the Amarna pharaohs whose memories were execrated under later rulers. Wherever a cartouche has been preserved, the name of Eye [i.e., Ay] has been erased and replaced by that of his successor Harmhab. In all but a single instance had it been overlooked and no change made. Thus the temple, which Eye had begun and finished, at least in the rear rooms with their fine paintings, was usurped by his successor and was thenceforth known as the temple of Harmhab. Seals on stoppers of wine jars from the temple magazines read: "Wine from the temple of Harmhab". Ay is believed to be the son of Yuya and Tjuyu, and therefore a brother of Queen Tiye, wife of Amenhotep III, and the Second Prophet of Amun, Anen. Hence, he would be the uncle of pharaohs Akhenaten and possibly Smenkhkare, assuming Smenkhkare was Akhenaten's brother rather than his son. Ay's Great Royal Wife was Tey, wet nurse to Nefertiti. It has been theorized that Nakhtmin, Ay's chosen successor, is Ay's son or adopted son, though their exact relationship is still up for debate. While we know the identity of Nakhtmin's mother, Iuy, there is no further evidence to support that she was one of Ay's wives. There is an often cited theory that Ay is the father of Nefertiti, wife of Akhenaten, and her sister Mutbenret. However, this hypothesis is likely wrong; nowhere are Ay and his Great Royal Wife Tey called the father and mother of Nefertiti, and Tey's only connection was that she was the "nurse of the Great Queen" Nefertiti. Ay appears as a villain in the 17th book in Lucien de Gieter's Papyrus comic book series (Tutankhamun, The Assassinated Pharaoh). Ay appears as a major character in Paul C. Doherty's trilogy of Ancient Egyptian novels, An Evil Spirit Out of the West, The Season of the Hyaena and The Year of the Cobra. Kerry Greenwood's novel, Out of the Black Land, features him as a greedy villain whose sole goal was accruing wealth. He is a character in Wolfgang Hohlbein's Die Prophezeihung (The Prophecy). He is also a major character in Michelle Moran's bestselling novel Nefertiti. Ay is the villain of Lucile Morrison's young adult novel The Lost Queen of Egypt (1937). He is also a character in Mika Waltari's historical novel The Egyptian, again depicted as immoral and villainous. Ay serves as a central character in Tut, portrayed by Ben Kingsley. Ay is a central character in Gwendolyn MacEwen's novel King of Egypt, King of Dreams, where he is portrayed as one of Akhenaten's closest confidants, spiritual antagonists, and supporters. The novel also presents Ay as Tiye's brother and one time lover, and it is suggested that he, rather than Amenhotep III, may Akhenaten's father. 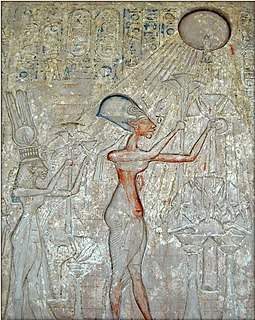 Much of the novel is told from Ay's perspective as he reluctantly attempts to navigate the changes of the Amarna period, and the second to last chapter is his memoir/confession near the end of his pharaonic reign, in which Ay admits to killing the ailing and blind Akhenaten at the dying pharaoh's request. ^ Hindley, Marshall. Featured Pharaoh: The God's Father Ay, Ancient Egypt , April/May 2006. p. 27–28. ^ Hawass, Zahi. "Scanning Tutankhamun", KMT . Volume 16, Number 2. p. 33. Summer 2005. ^ Hawass, Zahi. "Scanning Tutankhamun", KMT . Volume 16, Number 2. p. 34. Summer 2005. ^ "King Tut Not Murdered Violently, CT Scans Show", National Geographic, March 8, 2005. ^ Brier, Bob (2005). The Murder of Tutankhamen. Penguin Publishing Group. ISBN 978-1-101-66475-9. ^ Haywood, John (2005). The Penguin Historical Atlas of Ancient Civilizations. Penguin. p. 56. ISBN 978-0-14-101448-7. ^ King, Michael R.; Cooper, Gregory M. (2004). Who Killed King Tut? : Using Modern Forensics to Solve a 3,300-year-old Mystery. Prometheus Books, Publishers. ISBN 978-1-61592-612-1. ^ "King Tut's Chariot travels to New York". Archived from the original on 2010-07-31. ^ Jacobus Van Dijk, Horemheb and the Struggle for the Throne of Tutankhamun Archived 2016-03-04 at the Wayback Machine, BACE 7 (1996), p.33. ^ Van Dijk 1996, p.32-33. ^ MacEwen, Gwendolyn (1971). King of Egypt, King of Dreams. Toronto: Macmillan. Tadukhipa, in the Hurrian language Tadu-Hepa, was the daughter of Tushratta, king of Mitanni and his queen Juni, and niece of Artashumara. Tadukhipa's aunt Gilukhipa had married Pharaoh Amenhotep III in his 10th regnal year. Tadukhipa was to marry Amenhotep III more than two decades later. Tey was the wife of Kheperkheprure Ay, who was the penultimate pharaoh of Ancient Egypt's 18th dynasty. She was also the wet nurse of Queen Nefertiti. Tjuyu was an Egyptian noblewoman and the mother of queen Tiye, and the wife of Yuya. She is the grandmother of Akhenaten, and great grandmother of Tutankhamun. Sitamun was an Ancient Egyptian princess and queen consort during the 18th dynasty.